It was perhaps on this date, that the prophet Mani — he of Manichaeism — underwent his Passion at the hands of the Sassanid Empire in a Gundeshapur prison. 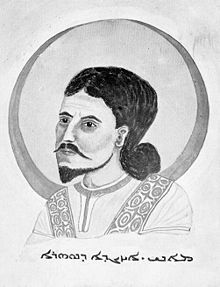 Perhaps more to the point for this blog is that Mani’s “crucifixion” as celebrated by his followers was a literary exultation: the 60-year-old died in prison after 26 days in chains, maybe even sooner than his captors had intended. After Mani “rose [from his body] to the residences of his greatness [in] the heights, and he met his shape,” the Sassanids decapitated the corpse to make the whole scene more properly resemble the awful majesty of an offended sovereign. But even as merely a metaphorical “execution,” Mani’s martyrdom merits mention. This seems like the sort of thing that someone ought to have revived in California in the 1970’s. 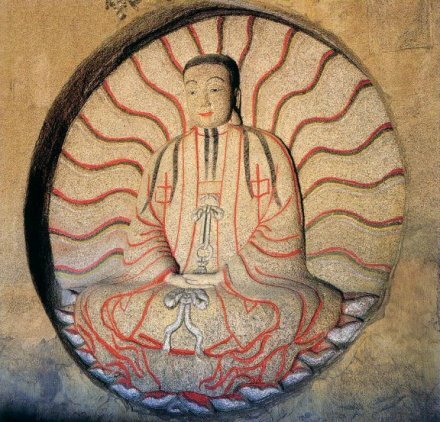 Shrine of Mani as Buddha in Quanzhou, China. Alas, though it once spanned the Eurasian landmass all the way to China, Manichaeism today is extinct except for its linguistic remnant … the word “manichean”. Most of us won’t do so well as to thrust our fame into the dictionary, but Mani’s shape-in-the-heights can’t be altogether satisfied with this word’s connotation of jejune, black-and-white dualism — as in a “Manichean struggle with a single overarching enemy called terrorism”. The man wrote his own holy book, after all, and it’s a bit more elegant than the likes of neoconservative foreign policy. And the second precept for hearers is that they shall not be false and they shall not be unjust to one another … he shall walk in truth. And a hearer shall love [another] hearer in the same way one loves one’s own brother and relatives, for they are children of the living family and the world of light. But one of Shapur’s less impressive heirs was persuaded by the sectarian Zoroastrian priesthood — for whom the Manicheans were an upstart rival — to bust Mani. It seems they were able to make use of the prophet’s distaste for war to question his patriotism. Some things never change. The founder’s laying down his life hardly slowed the faith’s growth; instead, it prospered as one of the more successful entrants in the confusing late-antiquity hustle and bustle of competing cults. Dualism was a hot mystical trend literally from ocean to ocean, and nobody proselytized it like Mani’s followers. Had it stayed that way, there’d be endowed chairs of Manichean gnosticism at every university and politicians conspicuously rubbing shoulders with Manichean clergy and Major League sluggers with WWMD bracelets. Instead, it’s a metonym for naivete. Them’s the breaks. In the West, at least, the lost sect’s unflattering reputation comes by way of no less a personage than St. Augustine of Hippo. You know what they say about the zeal of converts? Well, Augustine used to know Manichaeism from the inside. St. Augustine Sacrificing to a Manichaean Idol, 15th century painting by an unknown Flemish master. After spending his twenties as an enthusiastic Manichean, the future Church Father (re)converted to orthodox* Christianity and turned on his former philosophy with vehemence. His Confessions denounces a Manichean bishop with whom he once had an unsatisfying audience — “Faustus by name, a great snare of the devil.” That association might very well be the etymological root of that great literary devil-bargainer Dr. Faust. 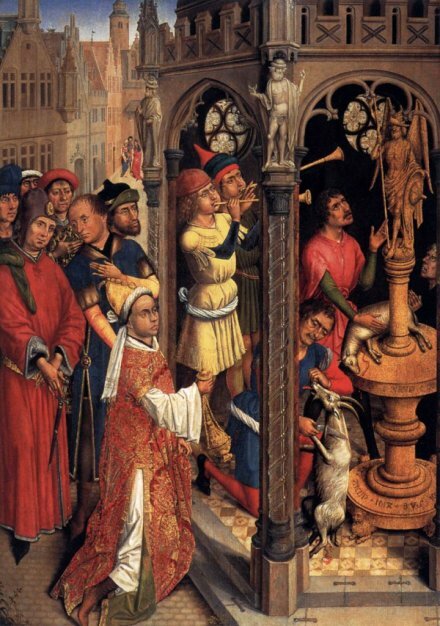 One could, at the minimum, follow a thread from Augustine’s establishment anti-dualism to the Middle Ages practice of calling any dualistic heresy — Bogomilism, Catharism, whatever — “Manichean”, and the intertwining of those forbidden gnostic traditions with Christendom’s devil mythology. 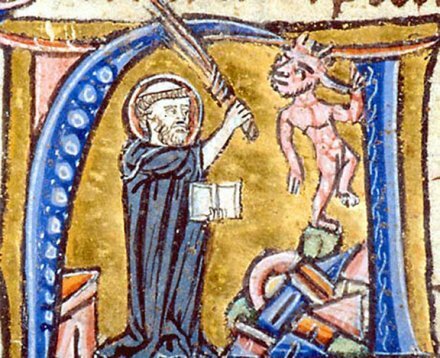 Medieval image of St. Augustine confounding devilish heresies. Nowhere in the early church before 400 does there appear to be such a tender and appealing piety, along with such a prominent place given to the Christ, except for Augustine and the Manichaean writings … In some essential features of Augustine’s spirituality we may perceive one of the most important channels through which the Gnostic religion of Manichaeism has exercised a lasting influence on western culture. * Manichaeism, at least in the North African context where Augustine engaged it, is probably best thought of as one of the competing strands within the Christian community rather than a rival religious edifice. (Gnosticism’s capacity to syncretize with varying spiritual traditions has always been essential to its appeal.) Manicheans themselves insisted that they were secta, within Christianity, not schisma, like the pagans. ** Augustine had particular cause to be down on the prospects of the City of Man: at the time of writing, Rome had just been sacked by the Visigoths.